Equity markets can be extremely volatile. 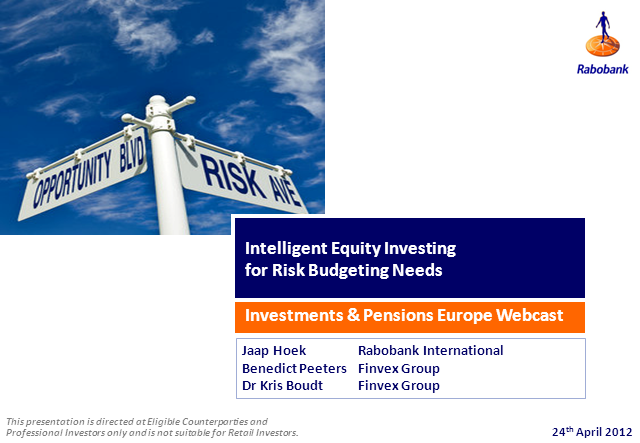 A risk-budget investment framework penalises the use of equities as the risks have increased and expected returns have decreased. Nevertheless, equities must continue to be an essential part of portfolios in order to provide asset diversification and be a long-term hedge against inflation. • Avoiding large losses or draw-downs can appreciably generate increased equity investment performance. • By focussing on smart risk reduction, one can generate excess returns across different economic cycles and equity universes. • Proper selection and weighting of equities based on risk criteria can bring substantial stability to an equity portfolio. • Risk efficient investing is a "smart" alternative to both active and passive equity investing.